SUBHEAD: Two studies of dispersal of nuclear contaminants into the Pacific Ocean from Fukusahima Daiichi Nuclear Plant. [IB Publisher's note: Different simulations often use different criteria to model behavior, so the results are not identical. From the simulations done to date it would seem that no Pacific shore will be save from Fukushima nuclear material, but many point to the west coast of North America getting the worst of it - worse than Hawaii, although we will be impacted]. 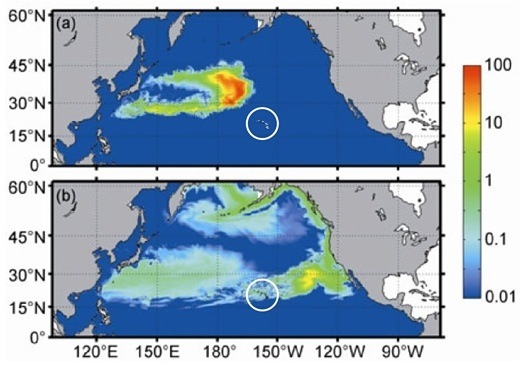 Image above: Simulation of distribution of Cesium 137 nuclear contamination spreading from Fukushima throughout Pacific at two years (above) and eight years (below). From original article. Note circle added to highlight Hawaii. Nuclear contaminants at the surface will move eastward in the Pacific as far as 140°W, thereafter dividing into two branches. For the south branch, nuclear contaminants will be transported westward by the equatorial current, and can reach the Philippines after 10 years’ time. In contrast, the north branch will arrive at the American west coast and then migrate to the Bering Sea. Given uncertainty of the volume released into the ocean, one source of leaked nuclear materials was idealized at a unit per second in the ocean model, and would be automatically shut off one month later. The forecast of the 137Cs distribution trend is shown in Figure 6. Because of the lack of space, only the distributions of 137Cs in the 2nd and 8th year are shown. Image above: Still from GIF animation below that simulates the distribution of Ceseum 137 nuclear contamination spreading from a depth of 1200 meters below ocean surface from Fukushima, Japan. The amount of radiation released in the nuclear accident has threatened the coastal environment with potential impacts on the Pacific Ocean. An international research team was established with the aim of [...] assessing the impact of radionuclides on the surrounding countries around the Pacific. 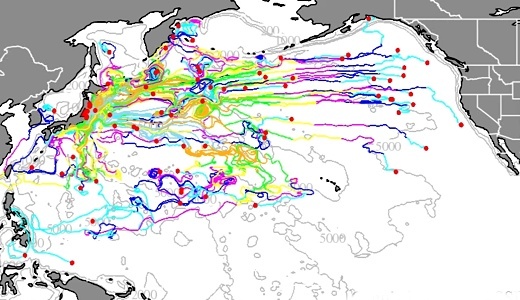 [...] The ocean model used for this activity is the global-coastal nested FVCOM model system. FVCOM is an unstructured grid Finite Volume Community Ocean Model (FVCOM) [...] At 50 m, particles spread over a large region and reach the western US coast after 5 years. [...] At 200 m, particles stay in the narrow region and move eastward. March 11 2011 was a tragic day for Japan and the world. The earthquake in Tohoku, Japan caused a tsunami, and the resulting tsunami-induced inundation has placed Japan into crisis. The amount of radiation released in the nuclear accident has threatened the coastal environment with potential impacts on the Pacific Ocean. An international research team was established with the aim of studying the mechanism of the tsunami, simulating the inundation, and assessing the impact of radionuclides on the surrounding countries around the Pacific. The team members include Dr. Changsheng Chen (Physical Oceanographer), Dr. Zhigang Lai (Physical Oceanographer), and Ms. Huichan Lin (Physical Oceanographer) at University of Massachusetts-Dartmouth (UMASSD)-USA, Dr. Robert C. Beardsley(Physical Oceanographer), Dr. Jian Lin (Geologist) and Dr. Rubao Ji (Biologist) at Woods Hole Oceanographic Institution (WHOI)-USA, Dr. Jun Sasaki at Yokohama National University-Japan and Dr. Chunyan Li (Physical Oceanographer) at Louisiana State University. The ocean model used for this activity is the global-coastal nested FVCOM model system. FVCOM is an unstructured grid Finite Volume Community Ocean Model (FVCOM) developed originally by Chen et al. (2003) and is being upgraded by the UMASSD-WHOI joint FVCOM development team (Chen et al., 2006a,b). Dr. Sasaki successfully applied FVCOM to simulate the 2004 tsunami and inundation in Banda Aceh in the Indian Ocean. We would like to share preliminary results of our particle tracer-tracking experiments. We welcome any comments and suggestions. If anyone is interested in working together with this team on this problem, please contact Dr. Chen at c1chen@umassd.edu (or phone: 508-910-6388). Variable depth tracking with initial releases of particles at 0 m, 50 m, 100 m, 200 m, 400 m, 600 m, 800 m and 1200 m.
One-hundred neutral buoyant water particles were released at each depth at 00:00 GMT March 12, 2011 and tracked in the three-dimensional flow field including the vertical motion. The results suggest that radionuclides in the deep water could be upwelled to the upper water column and then disperse over a broad wide region including the East China Sea and Japan Sea as well as the Bering Sea. It is my hope that anyone who wants to do something to help render the nuclear materials at Dai'ichi power plant's reactors (4) will get in touch with the folks at Morningstar Applied Physics as they have a nuclear remediation tech to render the radioactive materials inert, but they need public pressure built up globally to force the idiots in Tokyo to deploy this system to safely dismantle the plant's reactors and storage pools. ENENews is a great place to begin reading coverage of Fukushima disaster.